I saw the original TV production in 78. It was a multipart mini series much longer than this. I wish it was available in it’s original version. 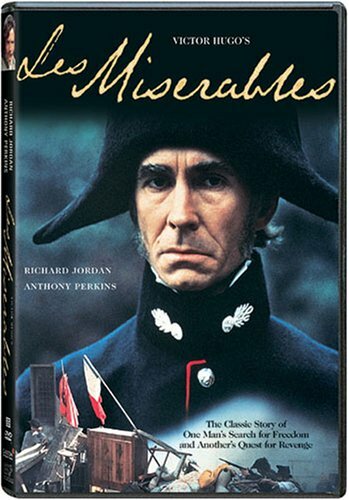 Seeing the full, original 78 TV Les Miserables inspired me to read the book! (that’s a BIG book) and that’s saying a lot for me since I’m not a natural reading type. The book is heavy on the church, mostly not in any contemporary productions. I’ve since seen the 1935 film version with Fredric March and Charles Laughton. I was excited to find a version with such great actors. But I was disappointed. Yesterday I watched the 1998 Neeson, Rush, Thurman version which was a disappointment. The whole background of ValJean’s poverty, prison, brutal treatment, and yet, he saves the lives of two fellow prisoners presented in 78 version are gone. Why should we care about this guy? In the 78 version, we know Valjean was a good man beaten down by cruel circumstances, this is critical to the build up of the pivotal scene, where the priest gives him the candle sticks and buys Valjean’s sole, removing all dark thoughts, telling him to use the silver for good. Valjean falls to his knees and cries and kisses the priest’s hand for the first kindness and light of hope he has seen in twenty years. We feel Valjean’s transformation from dark to light. I’ve since seen the heavily edited 78 version film and it is disappointing how much is gone. I watched it again last night, but I still feel it is my favorite. The other versions just don’t have the heart of the 78 version. They seem to be tailored as vehicles for the big name actors. Who is Richard Jordan? I still could not remember his full name. He is my best Valjean and Anthony Perkins my best Javert. I have not seen the musical. And I forgot to mention the musical theme throughout the 1978 TV version is superb and adds tremendously to the “heart” of this production. I wish I could find a soundtrack album.